trout. Its size is the perfect mimic of a shiner minnow, which all fish love. Speaking of shiners … When crappies, walleyes, trout and big ’gills are on a minnow feed, almost nothing outshines a Precious Metal Series Ratso. Choose a Nickel Head and Hook in Glow Brite, Glow Brite Blue or Smoke Glitter to match emerald shiners and fatheads… Pick a Gold Head and Hook and match golden shiners or mayflies. There are definitely times when metal rocks! 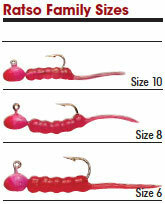 Choose the right color body, head and hook and the Ratso can mimic just about any forage that swims! This was a great find. The price was the best I’ve found. It does exactly what I was looking for it to do. Awesome action on these. My go too for finesse crappie through the ice. I was introduced to Ratso jigs by a friend that used them for ice fishing. We have found the to work well for spring crappie fishing here in the South. Custom Jigs and Spins is great to do business with, good communication, fast delivery. Great for trout through the ice. Just landed a 3 lb. Cutbow with the motor oil color. Good for open water crappie too. Chartreuse Ratso and Shrimpo are bucket fillers for bluegill and crappie. Just ordered plenty to share with my grumpy old fish friend. Also had a 20” largemouth inhale this jig. Great jig on panfish and in my area the crappie really seem to respond well. Awesome jig! It is candy to the crappie and blugill! Haven't found anything better!